I got a 2GB pqi memory stick to replace that awful cruzer. Not only is it clean and reliable, it works when plugged into my aluminum Apple keyboard. 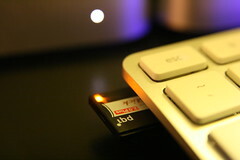 You can see from the adjacent photo that the USB drive is very small. I had to fashion an appropriate storage case from the plastic packaging (the supplied case is four times the size of the drive). Regardless, this pqi drive solves two recent technology problems nicely! Next Next post: How Can Brown Screw You?